Old theme, but I hope that will help not only to me. Last night I tried Aftetouch Calibration, I got a dialog window with instruction to press a key MIN/MAX and after that to hit Done button. I did this many times but without success. All time I got alert: "Can't calibrate, calibrate error". Can someone help me to resolve my dilemma, what I am doing wrong? I have Kronos X73 and last OS 3.1.2. Thanks in advance. They changed the way to do the aftertouch calibration in the latest OS, its correct in the latest manual, but the menu text in the display is old. You only press one time, and it has to go over to dark blue before you can press Done. You have to press very hard on one of the keys before you can start the bar moving to the right on the screen. As soon as you can see the bar going dark blue, stop and you are done. It is pointless to try to reach the maximum on the right. Even after doing this "calibration", chances are you won't see any improvement in the aftertouch response. This is a well-known problem. Thank you very much Synthee and KK for your effort to help me. I followed your recommendation but I didn't succeed. When I pressed key I can't get dark blue bar (for calibration), and when I hit button "done", after key press, I got alert window with text "can't calibrate". This is logical because I didn't get calibrating bar when I press a key. What is wrong I can't guess? If you have some other suggestions, maybe it will help. Thanks for all your attention. Could simply be that the FSR (force sensitive resistor) for aftertouch is disconnected from its small circuit. It is held there by a clip connector and it can happen sometimes when moving your Kronos. Otherwise the aftertouch hardware op-amp circuit is out of calibration. There are two small potentiometers on it which can be adjusted, but you have to know what you are doing. In short, it is probably not a big problem. See my signature for a mod I did some months ago on my unit. You can see the small circuit I am referring to. KK thanks for your reply. If something is disconnected, this has to be, from the beginning (when I bought Kronos X73, maybe transport issue), because I didn't move my Kronos from the start of usage. This is impossible that something disconnected in the period of usage, but obviously software calibration from OS not working for me, because of some irregularity. It is not impossible, that this is a hardware issue. I watch your video clip with instruction, how to make a hardware unit for after touch calibration, but it is impossible that I make it. Thanks for all. Do you get a grey bar at all and a cursor that moves when you press the key hard? On the picture it is exactly before its going to be a dark blue bar. I resolved one part from my problem last night! I use Kurzweil PC3LE8 like a keyboard controller, last night I tried after touch calibration but without connection with Kurzweil. Obviously Kurzweil connection make some problem to after touch calibration? I had to press key two times (to got gray bar and blue line), first soft and after that harder. After this action I got window exactly like on Synthee picture! When I press key harder blue line go to the right side, when I got satisfied position, I hit Done button. But I have to say that I never got that gray bar become blue. Why I don't know? But, all time I got alert window with "can't calibrate" message. I repeated many times but without success. Thanks again for all replies and all your attention. Try to press harder. If this doesn't work, calibration will keep giving you the same message. Once again, could be a disconnected FSR at the hardware AT op-amp circuit. It could also be better calibrated using the pots, even though the circuit as is remains limited. Common problem on the Kronos. Good post. I figured out how to do it too. 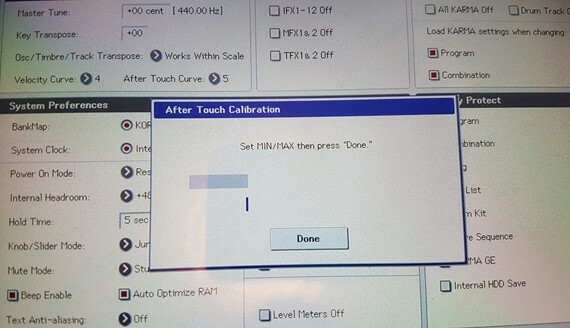 They are not kidding, you really need to press hard on this bugger to complete the calibration routine! Well... that is with the weighted keys on the K8. Once that's done mine was much more responsive. Thanks too all, for reply. I got same situation like on Synthree image, but grey bar never became blue, because of that, if I hit Done after that I got all time alert "can't calibrate". KK you mention that if I coudn't get a blue bar it is "better to calibrate using the pots". What is a "pot"? Thanks for all. KK - What is a "pot"? Pot is short for potentiometer. A pot is a variable resistor - a volume control is a common example. In the Kronos, aftertouch (AT) is first "calibrated" by a physical hardware sub-circuit, then again by a software thingie which includes the bar/screen previously mentioned. If the AT sensor under the keys is disconnected from the hardware or its sub-circuit out of calibration, the software can't do a thing to fix the problem. What potentiometer I can use to after touch calibration? Thanks in advance. The two potentiometers for this adjustment are on the aftertouch board itself, inside the Kronos. One sets the threshold and the other is gain. However, before making any adjustments, it would be prudent to check that the aftertouch sensor itself is working as it should. A multimeter would be needed to measure the resitance of the strip and its reaction to key pressure. Many thanks voip to clear me this. Because potentiometers for this adjustment, are on aftertouch board inside the Kronos, I will not be more curious. I don't have intention to "chop" for that inside the Kronos. You know this about curiosity and cat. I wish all best to all repliers.